As you can probably tell from the name of my blog, I love road trips. Hopping in the car and driving, with a loose plan and some cool apps, is my favorite thing to do. Today I’m going to share some of my favorite apps, books, and games for road trips, and tell you how you can win a very awesome road trip prize package! AroundMe: This is the app I use most on the road. AroundMe tells you the restaurants, coffee shops, bars, banks, gas stations, hospitals, hotels, pharmacies, movie theaters, supermarkets, parking, and even weather around you. Easily map your way to a location, or link to a review or web page to learn more. Gas Guru: Gas prices are inching higher again just as families embark on their summer road trips. Gas Guru locates the lowest pump prices in your vicinity, with easy-to-read maps to help you zero in on the savings. Roadside America: Created by America’s foremost experts in roadside attractions and oddities, this app will find those unique, “biggest ball of twine”-type stops that are a must on any road trip! I have my kids keep an eye on this app full-time during our road trips. Miles of Smiles: This book is full of fun facts, trivia and games that will keep kids and adults talking and laughing. One of our favorite games from this book is called “What Am I Counting?” One person starts counting something out loud and the rest of the passengers have to figure out what they are counting. It’s a tough game! Is he counting traffic lights? Trucks? Surveillance cameras? National Geographic Kids’ Almanac: Bursting with information about the culture, history, animal life, geography, wackiest weather and weird but true facts from every corner of the globe, this book offers an entire section that provides an overview of all 195 countries and another section containing info on our 50 states. My kids love the “weird but true” facts and I love that they are learning something new. And it’s full of the gorgeous photos you’d expect from a National Geographic publication! Rand McNally Activity Books: Are We There Yet? offers boredom-busting puzzles, games, and journaling and coloring pages. The Kids’ Road Atlas is the ideal companion for any US road trip with a page for every state that includes a road map, state facts, and a game or puzzle. I mapped our route on each state map before the trip so the kids could follow along. Travel Scavenger Hunt Card Game: Each person is dealt five cards depicting various things you might find on the road. There are the usual items, such as stop signs and hotels, but there are also some fun ones, like a “person with orange hair,” and a “really dirty car.” When you see the item on your card, you call it out, put your card aside, and draw a new one. There are also swap cards that let you exchange cards if you’ve got a particularly difficult one in your hand. The first person to find 10 items wins. The game goes pretty quickly and my kids always ask to play again. I love that it makes everyone look up from their devices and outside at their surroundings. Brain Quest: My kids love all versions of Brain Quest and the questions have sparked some interesting and educational conversations! Festivals, Food and Flying – It’s Summer in New Jersey! A good tip is to clean out your car before the trip. I like to put a plastic bag in the car for all of our trash to go into. It makes it a little less stressful if the car isn’t so nasty! What a great list! Those are some of my favorite apps too. When we want to discover a drive, I also downloaded Reader’s Digest app for Scenic Drives. I also like TVFoodMaps to find places that have been featured on TV. Yes – just discovered TVFoodMaps! We tried to get to a Diners, Drive-ins, and Dives restaurant in NOLA, but didn’t have time. I make sure to print at least the basic routes for our trip even though we use the maps on my iPhone, and the reservations at our hotels/campgrounds. You never know when the “app” might not be working or you’re out of range. Yep, learned this the hard way! Learned a few new things, and iExit? Never knew! Smart!! Awesome. We are just beginning to venture into the realm of road tripping with the kids. Thanks for all the great tips! Miles of Smiles sounds like a really fun book! I need to pick that up for our next trip. Great tips! I love the magnetic bingo idea! It’s sure better than giving them bubble wrap, lol. We like to give dd a travel journal, she has so much fun writing down her activities and observations and we love reading it together! Awesome post! I had never heard of some of the apps. I shared this on our social media today! Great tips and ideas. I never knew about those aps and will give them a try. Happy trails! I take it slow..Too many miles in one day doesnt make it fun for anyone. We are going across country from fla to co again (taking a different route) stopping twice and taking campy side of the road attraction pictures to break up the driving. 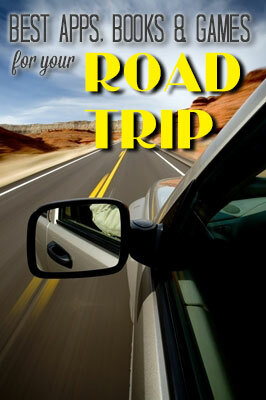 Thanks for writing about the apps im going to try them i was useing road tripper. That is a GREAT list of games! I’ll have to make sure we have those with us when we’re doing a road trip, whether in a car or on an airplane. Hand held devices a great, but only for a few hours.